A few years ago, a pal asked for some car-buying advice. She needed something big, and as a self-employed handbag designer and crafter, it had to be affordable. Even though I hadn’t driven it at the time, I recommended the Hyundai Santa Fe. The three-row crossover SUV had enough space for her to haul goods to market, and it gave her a lot of bang for her buck. Fast-forward four years, and I’ve finally had the chance to drive the big Hyundai, both on a long, boring drive down Central California’s San Joaquin Valley, and then on some stunning twisty roads from the valley to the coast. Turns out, my pal got everything she wanted, plus a whole lot more. Hyundai’s Santa Fe isn’t America’s best-selling three-row SUV. That honor goes to the Ford Explorer. In fact, it’s not even the second- or third bestseller on the list, with the Toyota Highlander, GMC Acadia and Chevrolet Traverse all pulling ahead of this Korean offering in terms of sales numbers for 2017. But remember, folks, sales numbers don’t tell the whole story. 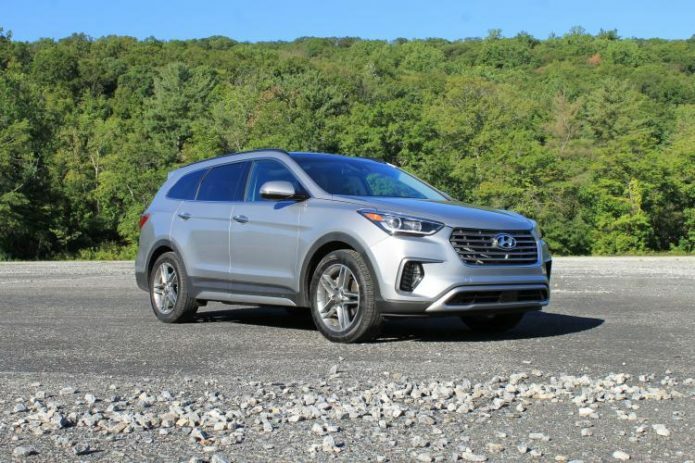 I found the Hyundai Santa Fe to be a comfortable ride with easy-to-manipulate tech and surprisingly sporty handling that belies its family footprint.